The XTENDEX® RS232 Extender extends one RS232 serial device up to 3,935 feet (1,200 meters) over a single CAT5e/6/7 cable. Compatible with all RS232 protocols. Sends RS232 data at 921.6 kbps up to 328 feet (100 meters) and 115.2 kbps up to 3,935 feet (1,200 meters). Extending serial touch screen monitors. Transferring data or files between computers. Connectors (for local and remote units): one female DB9 serial connector, one female RJ45 connector, one screw terminal pair. Powered by attached devices though DB9 serial cable. If additional power is required, a 9V, 1A power supply can be wired to the screw terminal pair. Operating temperature: -22 to 167°F (-30 to 75°C). Storage temperature: -40 to 185°F (-40 to 85°C). Operating/storage relative humidity: 5 to 95% non-condensing RH. 3,935 feet (1,200 meters) over CAT5e/6/7 cable. 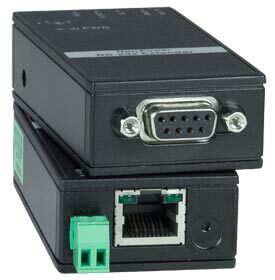 RS232 Extender – local and remote unit. One 6-inch DB9 male-to-male null modem serial cable.